IF A MAN. . . make a belter mouse-trap than his neighbor,” someone said, “though he build his home in the woods, the world will make a beaten path to his door.” The truth of this statement is being realized with profit by a number of “farmers” in the vicinity of New London, Ohio; only the traps are raised and not built, and they work equally well with rats, prairie dogs, and squirrels. New London is known as the ferret center of the world, because more of those animals are raised there than in any other place, some 25,000 a year being a conservative present-time estimate. A ferret is a small, slender animal of the weasel family. The typical ferret is about fourteen inches long, with a 5-1/2-inch tail. Its body is long and slender, its head small, and its nose pointed. Ferrets are native to Africa, although some authorities say that they came originally from Asia. The ferret has been raised in captivity for so many years that it cannot exist very long in the wild state. Two varieties of ferrets are raised on a commercial scale, for hunting rats and other animals. One, the fitch, is brown in color, with brown eyes, and looks something like a mink. The other type is the English or white ferret, which has pink eyes and is the same size as the fitch. About the only difference between the types is their appearance. Both kinds are good hunters. Scattered around New London are perhaps a score of ferret farms. One of the largest of these is operated by Levi Farnsworth, who has been raising the animals for forty-five years. He has produced as high as 10,000 a year. Farnsworth’s interest in ferrets started accidentally, and somewhat startlingly, when he was a small boy. One day he was playing near the barn when he saw a strange animal stick its head out of a hole. It started towards him. He didn’t wait for further investigation, but ran to the house. Breathlessly he described the animal, and did such a good job that everybody expected to see something as large and wild as a wolf. But when the monster was captured it proved to be a ferret, tame as a kitten. Two weeks later, ten baby ferrets were born. Then the owner of the mother ferret was discovered. He was a neighbor who had brought a pair of the animals over from England. The ferrets, minus one pair, were returned to him. When that pair grew up, Farnsworth built up a local reputation with them, as a rat destroyer. Rat hunts were organized, and sometimes as many as seventy-five rats would be caught in one of these campaigns. It was only natural that Farnsworth should start raising ferrets to sell. He advertised, increased his stock, and the enterprise grew until he now has one of the biggest ferret farms in the world, with about 2,000 animals in stock most of the time. A ferret is a natural-born hunter. This makes it valuable as a rat exterminator. Turn a properly reared ferret into a nest of rats, and it will not rest until every one of them is dead. The ferret is the only animal, Farnsworth says, that has proved efficient as a rat hunter. Many of his sales are to companies that specialize in ridding office buildings, warehouses, stock barns, chicken coops, and other structures of rats. They are widely used for cleaning out ships, where rats frequently become a great nuisance. A ferret must be broken for rats before it can be called an efficient hunter. Farnsworth recommends that mice or young rats be placed in a pen with the ferret. The ferret gets the idea immediately but, because of inexperience, does not do a perfect job the first time. Little points of technique, like the proper neck hold to get on a rat in order to make it give up the ghost immediately, must be learned by practice. After the ferret has dispatched one or two small rats or mice, or grown-up rats whose most damaging teeth have been knocked out, it is ready to tackle the fiercest of rat fighters. The battle invariably is a brief one, with the decision always in favor of the ferret. The rat generally rears itself on its hind legs, ready to lunge at its foe. The ferret approaches the rat in a sidling manner. Then, quicker than the eye can follow, it whirls and grabs the rat by the neck. That is the end of that particular rat. A ferret seizes its prey and holds it as tenaciously as a bulldog. Its hold can be broken by pressing the thumb just above its eyes. To rid a building of rats, ferrets are released where they can enter the rat holes. The animated rat traps seem to dash into the holes instinctively. They are built for work in such close quarters. In other words, they are properly streamlined. Incidentally, in raising ferrets for the market, the goal is somewhat different from that sought in breeding most other animals. Whereas the raiser of fur-bearing animals, chickens, hogs, and. the like, generally strives to produce the largest animals possible, the ferret breeder directs his efforts more toward the raising of small or medium-sized stock, which can wriggle through the smallest rat holes with ease. Because of their rat-hunting abilities, one or more ferrets frequently are kept as permanent residents of mills, cellars, grain elevators, and the like. They will keep the surrounding territory completely free of rats. However, Farnsworth thinks it better for the ferrets not to run loose all the time, but to be housed in pens except when at work catching rats. One reason why it is not wise to let ferrets roam over a farm is that they have a weakness for poultry. However, they can be used for ridding a poultry house of rats, simply by releasing them when the fowls are roosting. A ferret cannot climb, so that, when the chickens are off the floor, it cannot injure them. The fact that a ferret cannot climb, while a rat can, accounts for the apparent slowness with which ferrets sometimes rid a building of rats. The rats can go anywhere between the walls, but the ferrets must wait until the rats return to the ground before attacking. That the ferret, as a rat hunter, is of real economic value can be seen by considering for a moment the rat situation. Surveys made by government agencies indicate that there is at least one rat for every man, woman, and child in the United States. Each one of these more than 100,-000,000 rats destroys two dollars worth of food a year, on the average. This represents a loss that accounts for the full-time labor of 200,000 men. In addition to its destructiveness, the rat is a carrier of diseasesâ€”some of them, like the bubonic plague, extremely deadly. So, as a ratter, the ferret is a real friend of man. To many persons, perhaps, the ferret is best known as a rabbit hunter. Its ability to invade the burrows of rabbits, and chase them out where hunters can get them, has led to its widespread use. However, many states now prohibit the use of ferrets for hunting, in order that the rabbit population will not be wiped out by too much efficiency on the part of hunters equipped with ferrets, which they carry about in their pockets or special pouches. Purchasers of ferrets frequently devise novel uses for them. There is the case of the Kansas postmaster, who found them highly efficient for ridding land of prairie dogs. He discovered that two pairs of ferrets will clear seventy-five to 100 acres of prairie dogs in three or four months. The way he works is to keep the ferrets in a box with a wire front for two or three weeks before taking them out to the dog territory. Then he transports the box to one edge of the dog town, and arranges a small opening so the ferrets can enter and leave as they please. Once a week he takes water and milk to the box. The ferrets usually are out, but they return to get the food. When all the dog holes in the vicinity are cleaned out, he moves the ferrets to a new location, and in this way gradually works through the dog colony. The ferrets, in spite of their free lives, remain tame, so that he can pick them up wherever he finds them. IN SOME sections, including parts of the State of Washington, ground squirrels are destructive pests. Ferrets have proved effective aids to farmers in cleaning them out. The ferrets are trained to enter the squirrels’ holes and either kill them or chase them out where dogs can do the job. One man, with three ferrets and two dogs, destroyed sixty-two squirrels in less than two hours. A half-dozen ferrets will rid a farm of its squirrel population, and keep it that way. Not long ago, the ferret joined the medical profession in its fight against influenza. 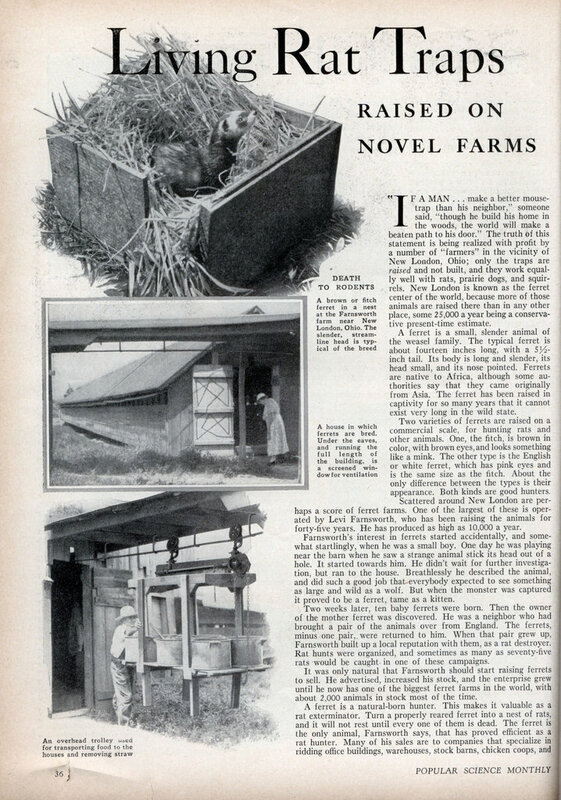 Farnsworth has sold animals for laboratory use in connection with the production of influenza serum. In England, it has been reported that the ferret apparently is the only animal that can be used for producing serum that is effective when administered to humans to combat influenza. Farnsworth’s ferret farm looks, to the visitor who turns into it from the gravel road, not unlike any other farm. A closer inspection reveals that there are several outbuildings not exactly like the usual farm structures. They are long and narrow, and have peculiar openings along the sides. These are the ferret houses. There are, in all, six of these long structures, each containing from seventy-five to 132 pens. They are twelve feet wide, and some of them are over 100 feet long. Inside, there is a three-foot alleyway running the length of each building. It is flanked by the ferret stalls or pens, each measuring two by four and one half feet, and thirty inches high. In front of each pen is wire netting, which aids ventilation and permits the animals to get exercise by running over it, like squirrels. Extending from one end of the building to the other on each side are two ventilating doors, one at the top and the other at the bottom. These are covered with netting, the top ones with mesh small enough to keep sparrows out. Floors of the stalls are solid, with the exception of about eighteen inches at the rear, which is slatted to permit moisture to escape. The pens must be kept dry, in order to prevent disease. Farnsworth uses wheat straw for bedding his animals, changing it whenever it becomes dirty. ANYONE who wants to keep a few ferrets can house them in a store box measuring about three by four feet, and thirty inches high, Farnsworth says. Young ferrets will thrive on a diet consisting principally of bread and unskimmed milk and meat. After reaching maturity in the fall, the animals can be kept on a diet of meat and water, although milk is desirable when it is available. Farnsworth has to use large-scale methods for feeding his big colony of ferrets. He raises cattle so that there will be a steady supply of fresh milk; and wheat which produces material for graham mush, and straw for bedding. Although meat is excellent food, it is not fed extensively because it is too costly. He cooks the graham mush in a large kettle holding seventy-five gallons. Two batches a day are prepared, for the animals are fed morning and night. The mush is ladled out into buckets and allowed to cool. For transporting this food to the various pen houses, Farnsworth uses an overhead-trolley system. The car is equipped with a geared winch by which the platform supporting the buckets of mush can be raised and lowered. The car is pushed along from house to house, and from pen to pen. When the pens are being cleaned, the food car is uncoupled and replaced with a wooden box for carrying out soiled straw. WITH this system, one man, working full time, can care for about 1,000 ferrets. The cost of raising a ferret to marketable size is about a dollar a year. The retail price varies with the season. Ferrets are cheapest in the fall, when the money spent on feeding the young animals has not reached a very high total. As the season advances, and the upkeep cost piles up, the prices rise. At present, prices range from two dollars to three dollars and higher for single animals. The breeding season for ferrets runs from about March 1 to September 1. There are, on the average, eight or nine young to a litter, although the number may reach fifteen. These are guarded very carefully by the jealous mother, who will pounce on anything that threatens to disturb them. A simple nest is made by placing straw in a box measuring twelve by fourteen inches, and about nine inches high. A depression is made in the straw for the mother ferret. She lines this with hair shed from her body. Born with their eyes closed, the young ferrets cannot see until they are six weeks old. The ferret raiser, by weaning the babies as soon as possible, frequently can secure a second litter the same season. The weaning process consists of feeding the young animals bread soaked in milk, with perhaps some finely chopped meat, as soon as they will eat it. By the time their eyes are open, they will come to the dish for their meals, and can be separated permanently from their mother. Farnsworth begins handling and training his ferrets as soon as their eyes are open. Thus, by the time they are ready for market, they are tame, and expert at catching rats and other animals. A ferret will hunt instinctively as soon as it reaches the proper age. Farnsworth has found that a ferret, when tame, makes as gentle a pet as a kitten. From a commercial standpoint, the ferret’s chief value is as an exterminator of rats and other pests, a business at which it is particularly effective. Its pelt has no value worth mentioning; its meat is not popular as food. 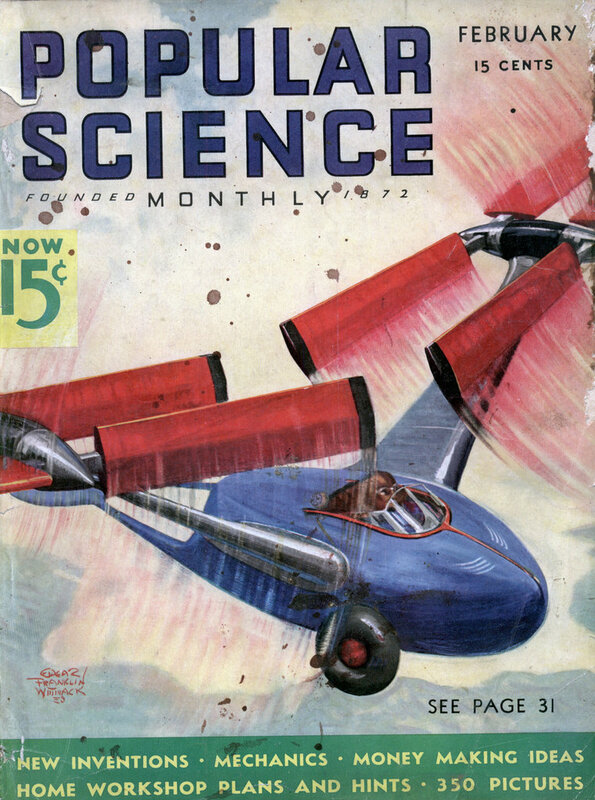 SOME people ask Farnsworth whether the use of ferrets for clearing a region of some pest might not act like a boomerang by introducing an even greater pest. He explains that the ferret, if released and left to shift for itself, does not survive very long. Dogs and other enemies soon destroy it, so that it cannot multiply. Therefore, there is little danger that escaped ferrets will overrun a region. Properly raised ferrets are so tame that, after they have completed a particular assignment of killing rats or other vermin, they can be picked up with ease. It generally is not a good idea to pull them forcibly from a hole, because this frightens them. They should be permitted to travel a few feet from the hole before being picked up. In some states, where hunting rabbits with ferrets is prohibited, permits are necessary for purchasing the animals or shipping them into the state.